FAIRFAX, Va.--(BUSINESS WIRE)--Predictions from the National Pest Management Association’s recently released Fall & Winter Bug Barometer® advises residents in many areas of the U.S. to beware of rodents during the cooler months. Wet winter conditions will drive rodents indoors in the North Central, Northwest and Southwest regions of the country while drought conditions in South Central U.S. this summer will likely cause rodent pressure to spike as they search for water and food. Rodent Awareness Week is October 21-27, 2018 and the NPMA is helping homeowners spot the common signs of a rodent infestation to keep mice and rats out as the temperatures drop. Droppings: Finding mice or rat droppings around the home is one of the most common signs of a rodent infestation. These pellets are often left behind in places where food is stored, such as kitchen cabinets or pantries, as well as under sinks, inside chewed cardboard boxes, along baseboards and on top of wall beams. Gnaw marks: Rodents can cause serious property damage by chewing through almost any type of material – including plastic and lead pipes – to obtain food or water. House mice and Norway rats are also known to gnaw on wires behind walls, sometimes causing house fires. Nests: Rodents prefer to nest in dark, secluded areas where there is little chance of disturbance. House mice, specifically, like to build their nests out of shredded paper products, cotton, packing materials, wall insulation and fabrics. If you see these materials scattered around the home, it might be a sign that rodents are near. Strange noises: Hearing strange noises in the walls, especially at night, can be a bit concerning. Chances are these sounds can be attributed to a family of rodents scurrying about the house, between the walls and up in attics. Rodents are especially fond of attics because they provide dark, secluded spots to build nests. For more information on how to keep homes rodent free, visit PestWorld.org. 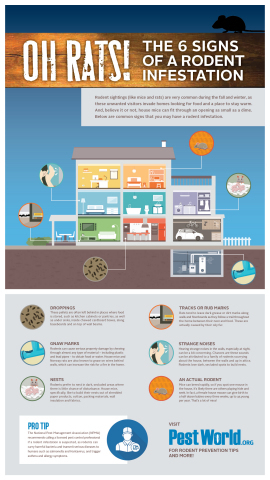 To kick off Rodent Awareness Week, the National Pest Management Association shares tips to keep homes rodent-free during fall and winter.